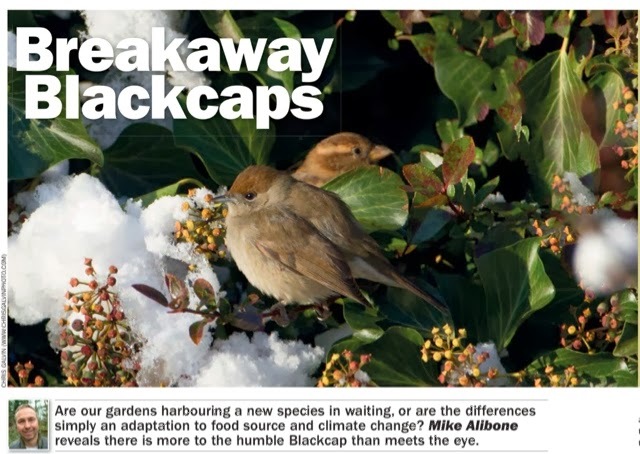 To celebrate the birthday of Charles Darwin it was good to catch up on a detailed article on micro-evolution in the Blackcap (Sylvia atricapilla), in the January issue of Birdwatch magazine (pages 60-63), written by Mike Alibone. 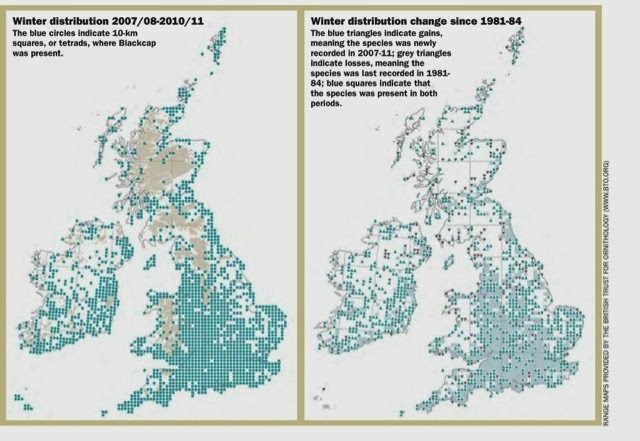 From the great work of the 'Atlas' contributors, ringers, and more from the public who take part in surveys such as the Big Garden Birdwatch the data on wintering Blackcap numbers shows a decline in the last 20 years. Understanding the movement of this population between breeding and wintering sites is crucial in discovering any threats to the survival of the species. Mike Alibone writes that the breeding grounds of our Blackcaps is in central Europe, and more specifically in southern Germany and Austria. From there 90% of the birds head south-west to the Iberian peninsula and north-west Africa for Winter, and the remainder head to the UK. The reasons for this split is not understood fully but will have a genetic component inherited by the young birds. These UK birds will have less far to travel and will therefore be able to return to the breeding grounds earlier than the others. For these reasons, Mike Alibone writes that over the last 50 years a sub-speciation has developed between the two populations. 1. Rounder wings due to shorter migration flights. 2. Longer narrower beak, with smaller gape, attributed to a more generalised diet, and feeding from feeding stations. 3. Browner mantle, head, and bill colour, aiding sub-population individual identification. It will be interesting to witness further speciation over the next decades, a good reason for supporting bird population research, in which ever way we can.